Developed for Athletes, by an Athlete. Headquartered in Central Virginia, Rubber Arm Inc. was founded by a former professional baseball player and high school quarterback who has suffered through many years of muscle and joint pain. Founder Lenny Wentz has been working in the Biopharmaceutical Industries for the past 15 years. 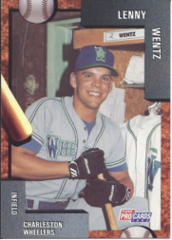 Lenny Wentz played high school football and baseball at Halifax County Senior High School where he was the starting quarterback and infielder/pitcher for the Blue Comets. After high school, Lenny was offered a baseball scholarship to Virginia Tech where he played from 1986 to 1990. In 1990, Lenny signed with the Cincinnati Reds and played in their organization until he was traded to the San Diego Padres in 1993. Shortly after that trade, Lenny suffered a career ending shoulder injury. He then became a high school teacher and head baseball coach at Amherst County High School. After teaching and coaching for 4 years, Lenny was offered a biopharmaceutical sales position. Lenny suffered a snow skiing accident in 1998 which tore the labrum muscle in his right hip. For years, Lenny dealt with severe pain which limited his physical activity. Before the injury he was an avid runner, weight lifter, and golfer. He could no longer enjoy these activities because of the pain they caused. In 2010, Lenny remembered an old family remedy his grandmother (who was a registered nurse) had introduced to him. In high school, he would rub the home remedy on after football and baseball games to help relieve his sore muscles. He thought that it might help with the current pain he was experiencing so he made a batch. The old home remedy worked! Because of his background in molecular and biochemistry, Lenny started looking at the ingredients and realized that with a few adjustments this muscle rub could be made into a product that could help millions of people who suffer from muscle soreness and pain. That is how Rubber Arm Muscle Rub began.